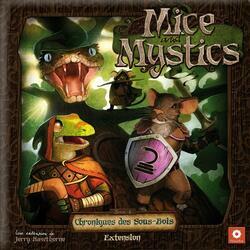 Mice and Mystics Chronicles of Sous Bois is the second expansion of the range after The Heart of Glorm. Continue the adventure of Prince Collin and his most faithful companions! Three new heroes join the adventure: Mélodie the shrew, Ansel the mouse and Jakobé the gecko. The old oak that sheltered Aboybourg is dying and our heroes must venture into the Sous-Bois in the hope of finding a new home. On their way will stand many plotters, not to mention the brigands and terrifying wild beasts. Enter this race against time with these unforgettable characters such as Prince Collin, Lily and others.